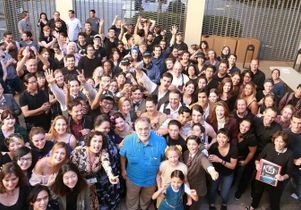 Five-time Academy Award-winning filmmaker Francis Ford Coppola is surrounded by many of the the approximately 100 UCLA theater, film and television students, faculty and cast members who worked on his Live Cinema production, "Distant Vision," at UCLA. 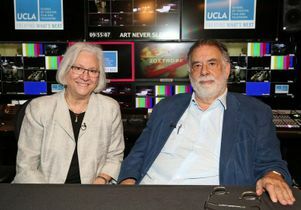 More than 75 students and faculty from the UCLA School of Theater, Film and Television participated in a monthlong experimental workshop with five-time Academy Award-winning filmmaker and alumnus Francis Ford Coppola that culminated Friday with a live broadcast of a production based on Coppola's concept of Live Cinema. Coppola returned to his alma mater, where he received an M.F.A. in theater arts in 1967, to run the experimental workshop, which was co-sponsored by UCLA TFT and American Zoetrope, Coppola’s production company. The workshop served as a “proof of concept” for a groundbreaking experiment involving Coppola’s Live Cinema, a new kind of movie-making that's performed live and viewed by an audience in real time. It utilizes feeds from multiple cameras, instant-replay servers and other sources, all of which the director can switch to live with technologically advanced broadcast equipment. The look and feel of the production are more cinematic in nature than what is typically employed for live dramatic and musical broadcasts, and the process infuses the production with in-the-moment energy of a live event. 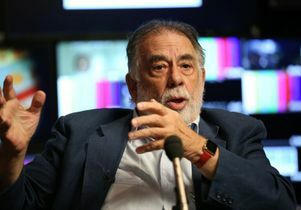 "I felt the need to experiment in order to learn the actual methodology of Live Cinema, which is a hybrid of theater, film and television," said Coppola, who is also a UCLA Optimist. "The shot is the basic element, as in film; the live performance is from theater; and the advanced television technology to enable it is borrowed from TV sports. It is very exciting to work in." UCLA TFT students and faculty served as actors, camera operators, film editors and producers and were involved in all areas of production of "Distant Vision." 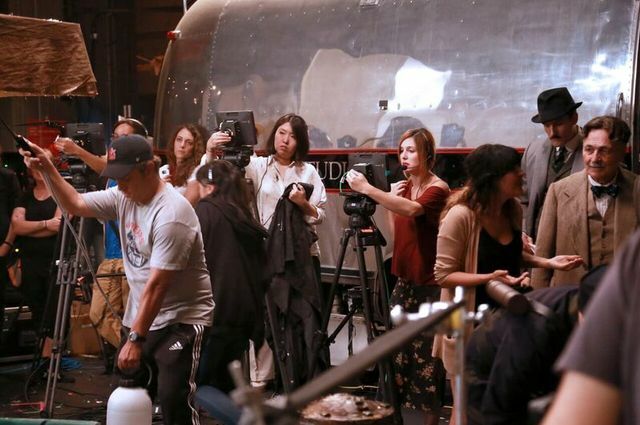 During the monthlong workshop that was held at the school's production facilities, UCLA TFT students and faculty served as crew members in all areas of production — acting, editing, producing, operating more than 40 cameras, sound, set design and construction, costumes, props and stage management. "I thought it was incredible," said John Dellaporta, a TFT graduate student in acting, who played Thomas Watson in a short pre-filmed clip in the production featuring Alexander Graham Bell and his assistant. "This was so very unique. ... In a way, this was the fullest realization of what the school's name — Theater, Film and Television — stands for. This is live performance, but with elements of live broadcasting, all shot with the visual esthetic of film. In many ways it's unprecedented." The fact that Dellaporta, whose passion is live theater, also served as a camera operator under the tutelage of film graduate students, was a big plus. "I got to learn so many of the ins and outs of working a camera," he said. "Just getting to work with one of the greatest living directors on the planet, who's very down-to-earth, was a real joy. From day one, he told us to call him Francis." Written and directed by Coppola, the production, "Distant Vision" — a 19th century term for television — is the story of three generations of an Italian-American family whose history spans the development of television. A live broadcast of an excerpted script from "Distant Vision" was presented Friday to a select audience at the Freud Playhouse. But Live Cinema, which depends on a script, extensive planning, rehearsal and coordination of a variety of sources to enable a real-time selection of views, music and effects, can also be simultaneously performed in multiple movie theaters, configured auditoriums, on network and cable television, or in home theaters or on personal devices via Internet streaming. The interconnectivity among film, theater, digital media, animation and television has an enormous impact on the state of the industry and the nature of storytelling itself, said TFT officials. 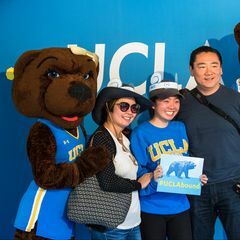 And the partnership between UCLA and Coppola underscores the school's vision, which reimagines entertainment and performing arts education as an interdisciplinary enterprise grounded in humanistic storytelling, social impact, global diversity, and technology and innovation. Key to this vision is providing students with opportunities to develop and create stories that enlighten, engage and inspire change for a better world. "It is our greatest honor to warmly welcome our most treasured alumnus, Francis Ford Coppola, back to his alma mater,” said TFT Dean Teri Schwartz. “We are thrilled to have UCLA TFT serve as the workshop home for 'Distant Vision,' Francis' groundbreaking new creative project. 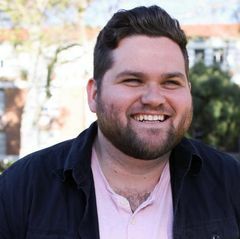 Francis has amazed and enthralled all of us — students, faculty and staff — with his fearless and bold mastery of visual storytelling at its deepest and most transformational state. We thank Francis for this magnificent opportunity for our students to work alongside him as he takes cinema into a very exciting and inspiring future." 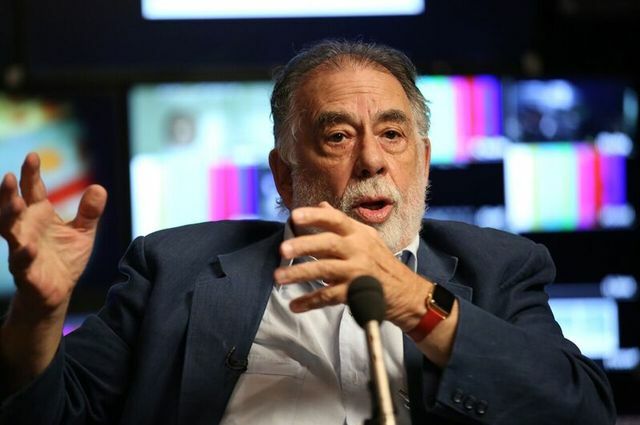 At a press conference Saturday, Coppola said he doesn't want to live in a "canned" world. He is pioneering a form of cinema that combines the best of filmmaking, live theater and television. A short behind-the-scenes documentary about the making of "Distant Vision" is in the works by five TFT students, who started shooting when Coppola began coming on campus to meet with TFT department heads. This team of students also made a three-minute video (shown below) on the experience. "At first mention of the workshop, everyone said they were absolutely going to do this," said Cecilia Albertini, an MFA student in film directing and the director of the documentary. "Everyone knew it was a once-in-a-lifetime opportunity. Everyone was so excited. Every day, we came in knowing that we would learn something new. ... He is a very generous person," she said of Coppola, "and loved to talk to us and explain what was happening." As one of the most influential and innovative filmmakers of our time, as well as a writer, director, producer and technological pioneer, Coppola has created a body of work that has helped to shape contemporary American cinema. Zoetrope-produced films, including such classes as "The Godfather" (1972) and "Apocalypse Now" (1979), have received 16 Academy Awards and 70 nominations. In addition to receiving the Academy of Motion Pictures Arts and Sciences' Irving G. Thalberg Memorial Award, Coppola is the recipient of Golden Globe, BAFTA, DGA and WGA Awards and earned two Palme d'Or prizes from the Cannes Film Festival for "The Conversation" (1974) and "Apocalypse Now." 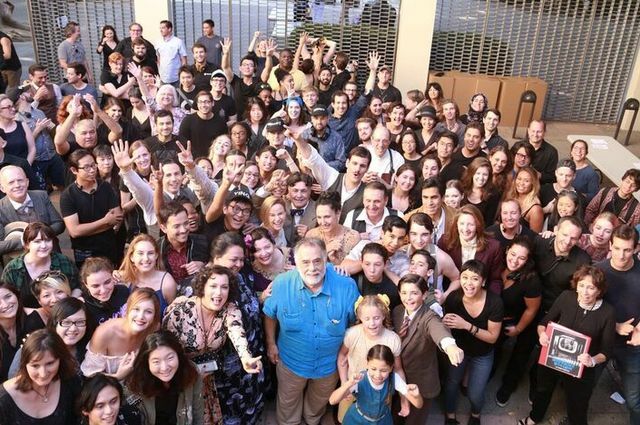 More than 75 UCLA TFT students and faculty served as crew members in all areas of production. Coppola on the set of "Distant Vision," which was produced at UCLA. 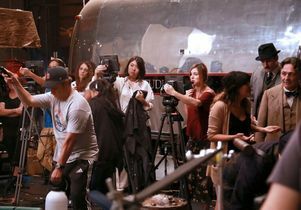 Coppola brought his "Silverfish" Airstream trailer, his mobile technical facilities, to the campus for the production.